Biography And Paintings of Irish Classical History Painter. A pioneer figure in the history of Irish art, and the greatest 18th century Irish exponent of history painting, the eminent classical artist James Barry was born in County Cork where he absorbed the fundamentals of drawing and painting from local painter John Butts, with whom he studied for a time. But he was largely self-taught as an artist, and first attempted oil-painting at the age of seventeen. In 1763 went to Dublin, and studied under Jacob Ennis at the drawing school of the Royal Dublin Society. Here he attracted the patronage of Edmund Burke who, in 1764, gave him an introduction to Joshua Reynolds, President of the Royal Academy in London. Encouraged and supported by both men, Barry visited Italy from 1766 to 1771 to study the Old Masters and the Renaissance Art. In 1771, he returned to London where he busied himself with commercial activities such as printmaking, and produced paintings of classical and historical subjects. Barry's aim was to be a great history painter in the tradition of Mantegna and Poussin, preferring to paint dramatic subjects from Milton and Shakespeare, heroic self-portraits, and combinations of myth and contemporary politics. He exhibited works at the Royal Academy, becoming a member in 1773 and professor of painting in 1782. In 1774, Barry offered to redecorate the Great Room of the Royal Society of Arts with a series of grandiose historical paintings entitled "The Progress of Human Culture." At first, his idea was rejected by the artists, but in 1777 his offer was accepted. His series of six paintings on the progress of human knowledge and culture - described as "Britain's late, great answer to the Sistine Chapel" - took him six years to complete after which the members of the Society awarded him two exhibitions. Unfortunately, due to financial issues - Barry was paid a paltry £500 for his six pictures - together with his disillusionment with contemporary patronage, Barry quarrelled with Sir Joshua Reynolds, as well as the Academy and the Government. This led to his expulsion from the Academy. Between 1783 and his death, in 1806, he finished only four major historical artworks, of which none were sold during his lifetime. He fell ill in 1803 and died in poverty in 1806. Noted as one of the earliest romantic artists in England, (see English Figurative Painting 18th century) James Barry was one of the most important Irish Neoclassical painters and exerted a significant influence on William Blake, and is considered one of the most significant figures of eighteenth century art in Ireland. 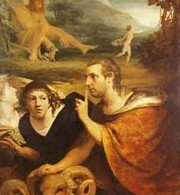 Ulysses and Polyphemus (1776), is a mythological painting which shows the classical hero Ulysses and a companion escaping from the cave of the blind giant Polyphemus, disguised as sheep. On an autobiographical level it amounts to a double portrait of Barry and his patron Edmund Burke. Burke is urging Barry to moderate his criticism of the British Government's policies, which hastened his eventual expulsion from the Royal Academy. The auction record for a work by the history painter James Barry was set in 2006, when his Shakespearean painting, entitled King Lear weeping over the body of Cordelia, was sold at Sotheby's, in London, for £982,400.  For details of other academic painters, see: Irish Artists: Biographies.  For more about mythological/allegorical painters like James Barry, see: Irish Art Guide.  For more about history (istoria) painting, see: Homepage.